VSAT feed assembly with OMT, transmit and receive ports and filters. Example VSAT feed assembly with transmit and receive ports. Ku Filter /OMT assembly p/n 718312 Model : 0800-2598 and feed horn Model 0800-1375. For mounting, the transmit module must be attached at the left and the whole assembly clamped using rings on the 2.5 W transmit module plus the circular tube just behind the feed horn. A similar unit exists p/n 718310, Model 0800-2712 which has a disk with polarisation scale. The disk together with the circular tube just behind the horn allow the assembly to be held with two clamps. This arrangement is suitable where the transmit arrangement involves a flexible waveguide and the transmit modules are fixed to the feed arm.. This assembly is designed to transmit on one polarisation and receive on the other. As shown, transmit polarisation is vertical and receive horizontal. To change this turn the whole unit through 90 degrees. In actual satellite service that the assembly will be tilted to some calculated angle and set to an accuracy of +/- 1 deg. Start with the feed set to receive nominal horizontal or vertical and then turn the feed clockwise if the polarisation angle is positive number, while facing the satellite. Attach the Low Noise amplifier/Block down-converter (LNB) at the top sidearm waveguide. Attach the transmitter or transmit waveguide to the left end o of the centreline waveguide. In both cases take care that the rectangular holes align correctly, as do any gaskets used. Vertical polarisation refers to the tiny vertical half dipole pin that sticks up through the broad face of the rectangular waveguide. Vertically polarised transmit signals pass through the whole assembly along the centreline. Filters are incorporated to stop leakage of the transmitter output into the low noise receiver. If this happens the noise floor increases, the gain reduces and in the worst case the LNB is permanently damaged (burned out). 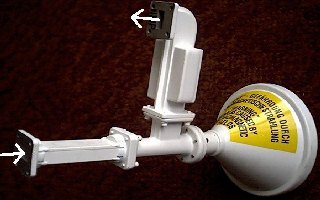 If you have no receive signal and a dead LNB, don't keep replacing LNBs and blowing them all up. Test replacement LNBs with the transmitter off. There must be a filter in front of the LNB to protect it. Note that a smaller feed horn exists called 0800-309. Outside diameter 13.3 cm. (5.23 inches). Feed opening diameter 11.2cm. Length 9.1 cm. This is intended for f/d=0.6 antennas such as 1123, 1124, 1125, 1183, 1184, 1251, 1255, 1381, 1383.